On view at the Royal Institute of British Architects (RIBA) in London is When in Rome - A Collective Reflection on the Eternal City. The exhibition combines two previous shows, Re-Constructivist Architecture, which was at New York's Ierimonti Gallery, and Unbuilt Rome, which was on view at CAMPO in Rome. Both shows closed earlier this year, but are re-opened together in this show. Curated by Jacopo Costanzo, Giulia Leone and Valentino Danilo Matteis, When in Rome exhibits 22 projects from 19 architecture firms and designers from around the world who have all plunged into Rome's past to reframe an architectural future for the city. 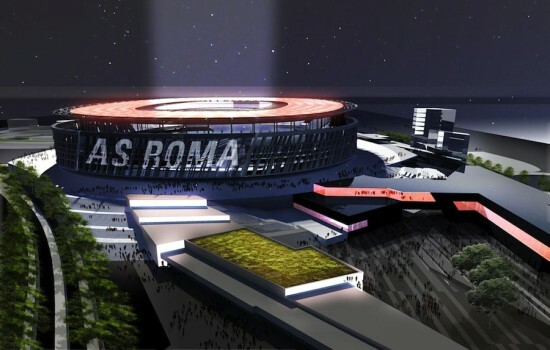 As a testament to their united vision, the two previous exhibits' convergence at RIBA allows two strands of speculative approaches to architectural intervention in Rome to be viewed in unison. It becomes evident that fundamentally they speak the same language—be it an abstraction or adaptation of the past or a reaction to it. Fitting in 22 projects is no mean feat. Like Re-constructivist Architecture did at the Ierimonti Gallery, projects fill the three walls. However, RIBA's "Practice Space," where the exhibition is located, does so on a larger scale. The extra space means that models—some of which could not be shown in New York—are afforded more room, though they cannot be viewed in the round. While the exhibits in New York and Rome placed the projects' accompanying texts at eye level, in the RIBA show, sometimes viewers are forced to crouch or craning their necks to read them. Aside from this, the means of conceptual representation in When in Rome sheds light on emerging trends in architectural representation. 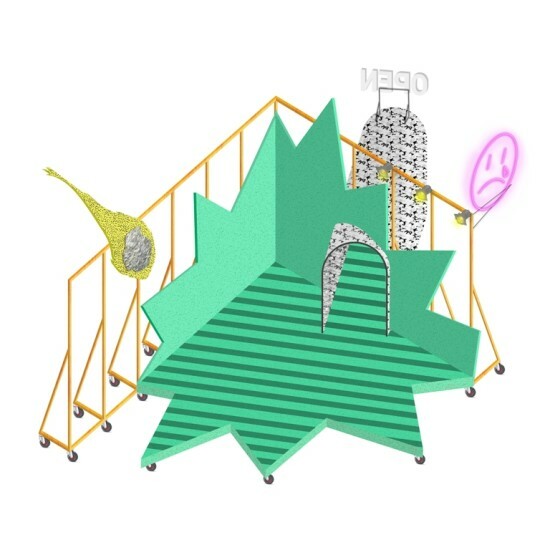 Collages and similar graphic methods are favored by most, with the projects from Re-constructivist Architecture using classical motifs or settings to engender a sense of identity and historical connection within new Roman architecture. 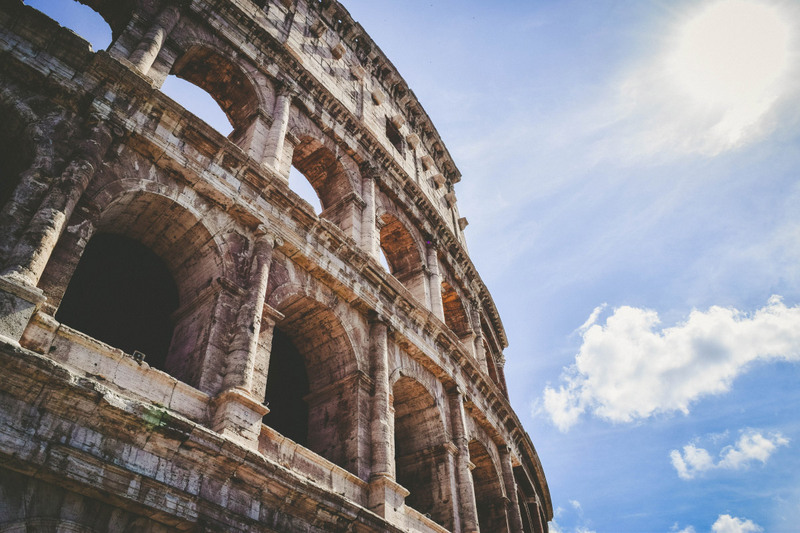 In When in Rome, classical art and architecture is often abstracted to reimagine locales, producing artwork that riffs on this classical frame of reference. This can be seen with the work of Portuguese studio fala atelier, French firm jbmn architects, and False Mirror Office from Italy. Seeing the projects together makes it clear that the two exhibitions this show derives the work from converge well together. 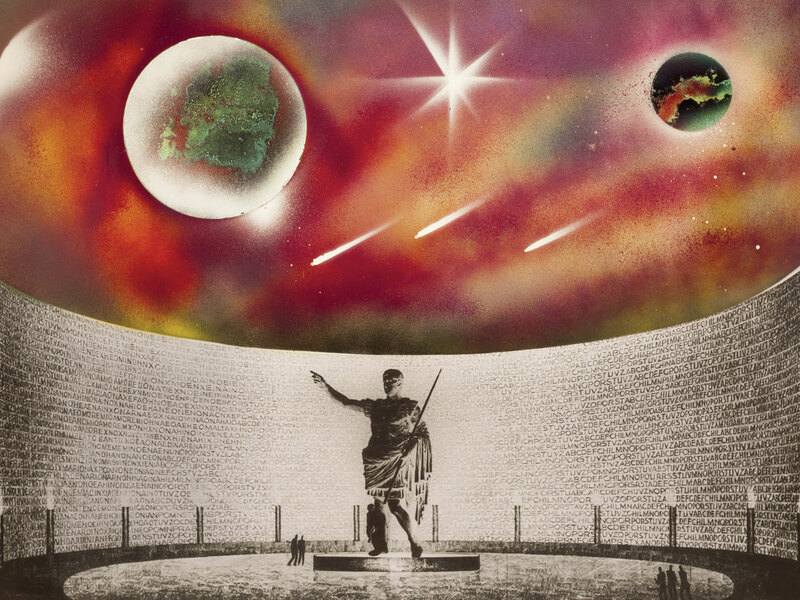 Projects such as Supervoid's adaptation of Adalberto Libera's never-realized Augustus Mausoleum and Shrine to the Fallen soldiers in East Africa and La Macchina Studio's Triumphal 17 fit well with the manifesto of Re-constructivist Architecture, despite both originally being for Unbuilt Rome. Despite the similarities between the works and themes in Re-constructivist Architecture and Unbuilt Rome, the projects are displayed separately, but without any markers separating them. 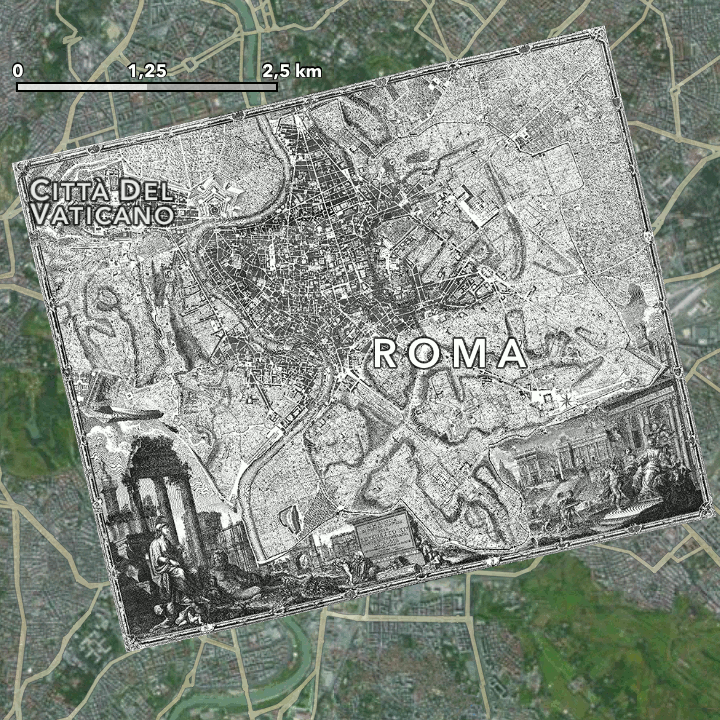 The projects from "Unbuilt Rome" are bound together by Jacopo Valentini' photographs of the nine sites that never saw the presented projects constructed. 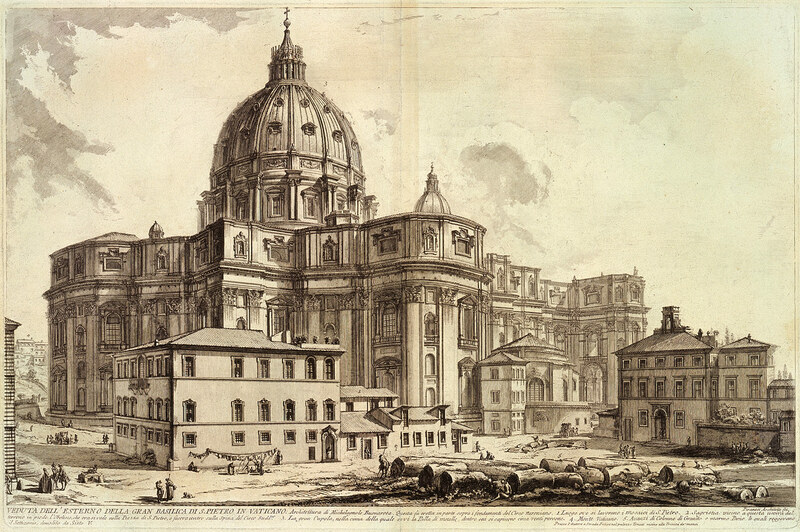 Co-curator Jacopo Costanzo told The Architect's Newspaper (AN) that both of the exhibitions used Rome "as a theatre." 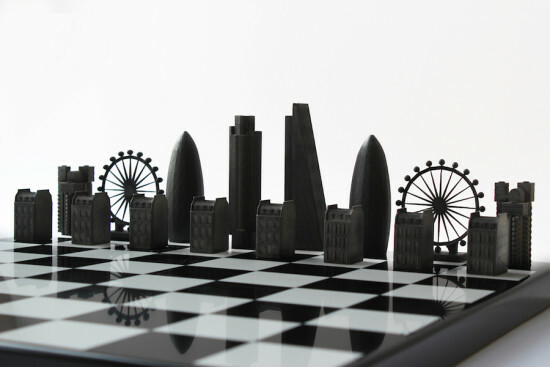 He believes the array of projects could be seen as a sign of contemporary trends rather than as a unified movement. 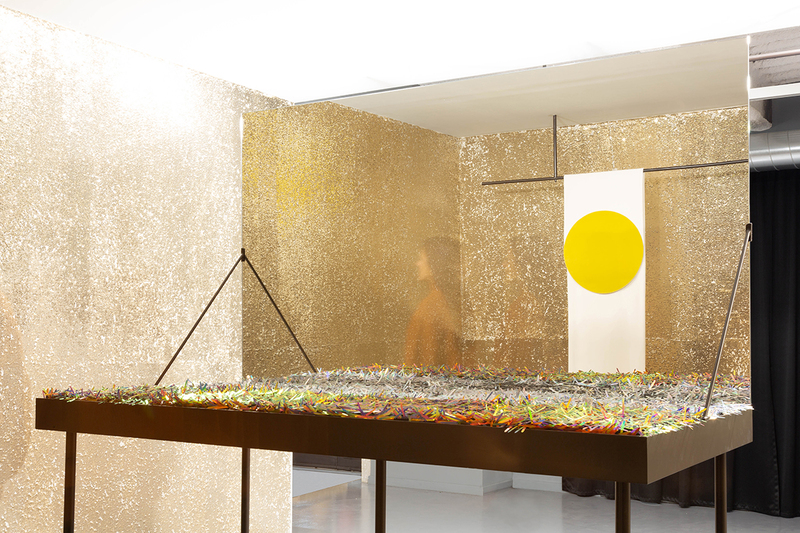 "The show at RIBA can present a sort of contemporary map of what it's going on in the generation of architects born in the 1980s," Costanzo added, noting that many architecture studios featured in When in Rome are young practices, with many based either in Italy or with experience working in the country. When in Rome - A Collective Reflection on the Eternal City RIBA Practice Space 66 Portland Place, London, W1B 1AD Through October 8. 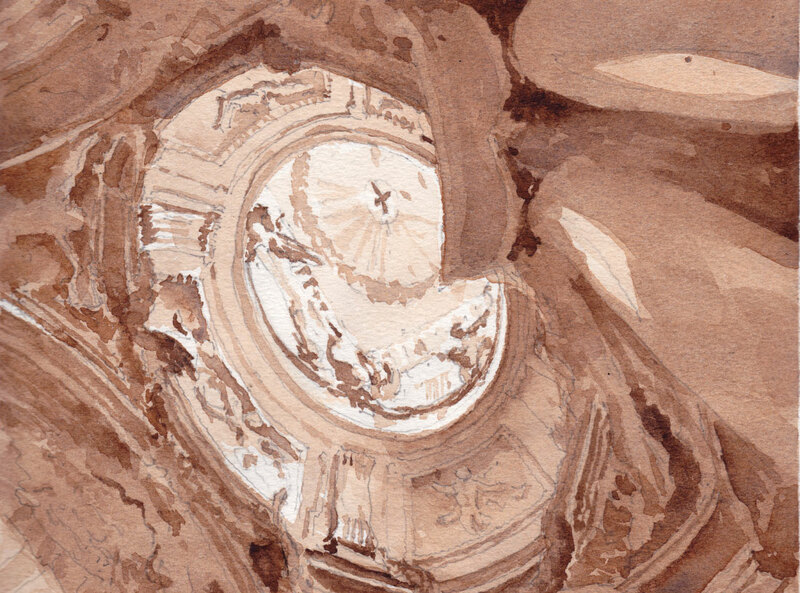 "Generazione: A Call From Rome," a tavola rotunda or round table, was just convened at the Acquario Romano, home to the city’s Casa dell'Architettura di Roma. The gathering aimed to address a range of issues relevant to the generation of young architects just entering into professional practice. This new approach, according to Jacopo Costanzo, organizer of the tavola rotunda, asks architects to “draw from archives—mental, digital, or printed on paper... distant from the typical parametric and highly schematic rationales that characterized the last thirty years of design in architecture.” It is a movement asking for a break from the digital practice so dominant in the profession, and a return to a more locally and culturally focused approach. It featured two young architecture practices committed to newer and—for them—more authentic approaches to working in the world. UNULAUNU, from Zurich, Switzerland/Bucharest, Romania, and TRAUMNOVELLE, from Geneva, Switzerland/Brussels, Belgium, are committed to moving away from an obsession with digital production as the only tool for design and toward a new way of conceiving, presenting, and thinking about design. For example, TRAUMNOVELLE's three principals, Léone Drapeaud, Manuel León Fanjul, and Johnny Leya, claim to champion “a multi-disciplinary approach with architecture at the crossroads.” They eschew traditional client relationships and instead seek their own areas in which to apply their architectural educations. Instead of working to find clients, they imagine their own projects merging the conditions of contemporary life and then use “architecture and fiction as analytical, critical, and subversive tools to emphasize contemporary issues and dissect their resolutions.” Their non-traditional research practice is not necessarily a unique one for a young firm without commissions but these Belgians leave little room for a move into a conventional mode of production. 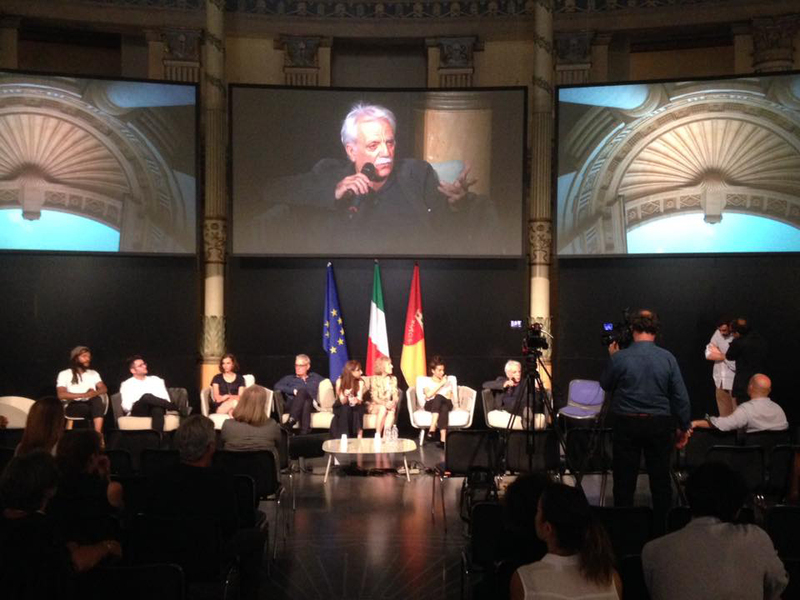 The roundtable discussion by Nicola Di Battista of Domus, architect Giuseppe Pasquali, artist Nancy Goldring, historian Lea-Catherine Szacka, and this writer, spoke about the history of new approaches to architecture, the value of drawing as a mode of production, and the special conditions of Italian design. The commentators—from their different perspectives—all supported the new approach but warned about the pitfalls faced by past attempts to create new models of practice. It is hoped that these young practices were not fazed by these critics and instead that this first call from the home of so many other architecture revolutions will produce another. 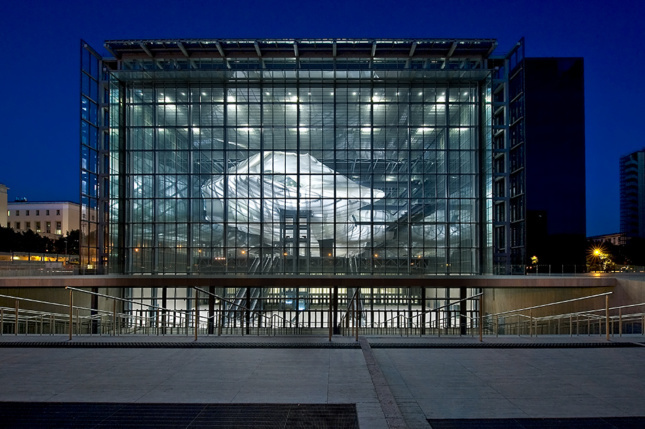 After nearly two decades of designing, planning, and construction, Rome-based architecture firm Fuksas's $262 million Rome-EUR Convention Center is finally complete, along with an adjacent hotel. Dubbed the "Cloud" due to a suspended white curvaceous volume that dominates the 592,000-square-foot space and appears to loom over the concourse, the convention center has been in the making for some 18 years with design work starting in 1998. Now, though, the building is fully open and accessible to the public. 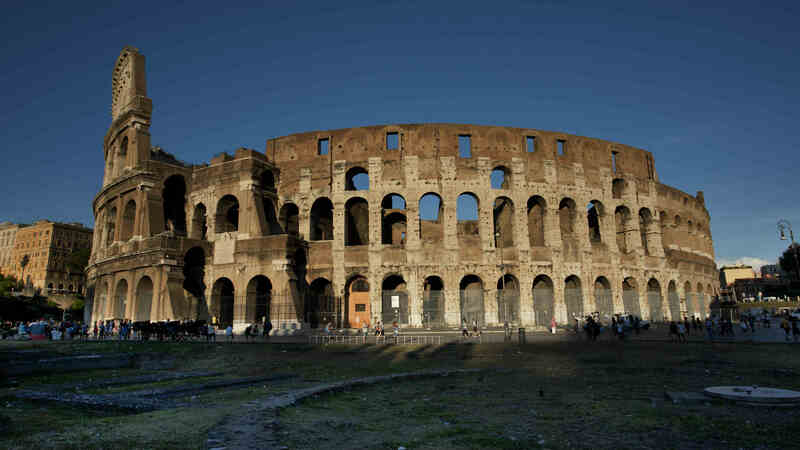 It's located in the EUR area of Rome—an area known as being a business and residential district. Encasing the "Cloud" is what Fuksas call the "Theca." The steel structure uses a double-glass facade to expose the cloud to passersby and give the white volume visual precedence. "The 'Cloud' represents the heart of the project. Its construction within the 'box' of the Theca underlines the juxtaposition between a free spatial articulation, without rules, and a geometrically defined shape," described Fuksas on their website. "The Cloud is the distinctive architectural element of the project: The steel rib structure... provides an extraordinary visual effect, and is covered by a 15,000-square-meter transparent curtain." Inside, visitors can access numerous exhibition spaces and auditoriums, part of a flexible space that boasts a seated capacity of nearly 9,000. Included within this is a grand 1,760-seat auditorium (found toward the Cloud's rear) that also offers snack points and support services. Meanwhile, large conference rooms totaling 6,500 seats can also be found within the center. (Courtesy Moreno Maggi) The "Cloud" and "Theca" are two of three elements that "define" the scheme. The third is the "Blade"—a slender 441-room hotel that lies next to the convention center. 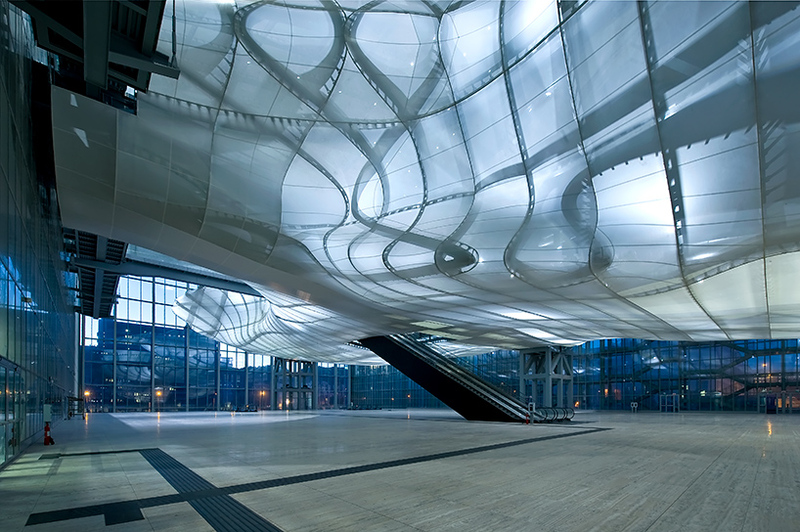 Fuksas sees it as being an "independent and autonomous structure." All in all, the scheme is touted to make between $330-440 million-a-year, quickly recouping its construction costs. A climate-control system will also aid the scheme's finances in terms of energy usage: Variable flow air conditioning mediates homogenous gains in rooms prone to crowding and photovoltaic elements facilitate the on-site production of electricity.